The Pew Research Center has released a new poll on the death penalty. 62% favor the death penalty for people convicted of murder while 31% are opposed. That is generally in line with polling on the death penalty over the past several years. Of those who responded they oppose the death penalty, 27% said it's wrong or immoral and 27% said they were concerned about wrongful convictions. In the poll 20 years ago, 41% of those opposed based their objections on moral grounds and 11% of them objected due to the potential injustice of a wrongful conviction. Colorado is a major step closer to eliminating the death penalty. The bill to repeal it and use the savings on solving cold cases passed the House by a single vote today. It now goes to the Senate. The last death penalty case in Colorado cost $1.4 million to prosecute. 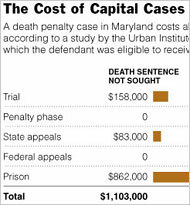 It costs about $70,000 for a non-capital murder case. The measure will limit capital cases to those with biological or DNA evidence, a videotaped confession or a videotape linking the defendant to a homicide. Those are among the steepest hurdles faced by prosecutors in the 35 states that have a death penalty. The Maryland Senate has approved it and Gov. Martin O'Malley has indicated he will sign it. Amid a national debate over executions, Maryland's evidentiary limitations will become the most stringent of any of the 35 states that have capital punishment on the books. As mentioned earlier, the New Mexico legislature has voted to repeal the death penalty. Gov. Bill Richardson hasn't decided whether to sign it. He's asking for input. Here's the number: (505) 476-2225. The number will record your request. There is no human being on the phone, just a recorder. If you are near Santa Fe, the Governor is holding meetings with the public tomorrow from 2:30 to 5, first come-first serve...you get five minutes with him to tell him your position. What do Maryland, New Mexico, Colorado, Kansas, Nebraska and New Hampshire have in common these days? All are considering bills to abolish the death penalty. Why? It's too expensive. In five other states, Virginia, Arizona, Kentucky, Mississippi, New Jersey and Vermont lawmakers are considering releasing non-violent inmates early or cutting their sentences to cut expenses. Good news out of Montana: The state senate passed a bill abolishing the death penalty. With a 27 to 23 vote, Montana State senators on Tuesday approved a bill that would abolish capital punishment. Montana is one of 36 states that currently has the death penalty and bill sponsor, Democrat Dave Wanzenried of Missoula, hopes that will change. His bill would replace the death penalty with life in prison without the possibility of parole. 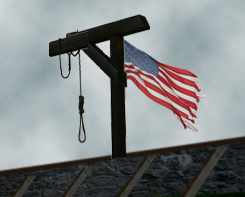 Via Sentencing Law and Policy, a legislator in New Hampshire has introduced a bill to restore executions by firing squad. Burridge’s bill recommends a firing squad of five men, one whose gun carries blanks, to keep it unclear which shooter is responsible for death. 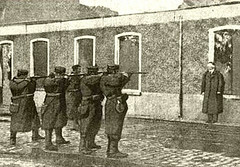 During the execution, the prisoner would be hooded and wear a target over his heart. Each shooter would aim for that target. Update: A transcript of Gov. Corzine's remarks is here. In an extended and often passionate speech from his office at the state capitol, Mr. Corzine declared an end to what he called “state-endorsed killing,” and said that New Jersey could serve as a model for other states. New Jersey is the first state to legislatively ban the death penalty in more than 40 years. The eight men on New Jersey's death row will now serve life in prison without parole. In Rome, Italy, lights will flush through the arches of the Coliseum for 24 hours in recognition of the repeal.